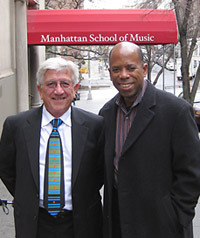 Ray Kelley, Life Member of Local 47, was the guest lecturer on Dec. 10, 2008, at the Manhattan School of Music (MSM) in New York City. He spoke under the auspices of "The Art of Orchestral Performance" Master Class Series. As a professional cellist, Ray's career spans 53 years in diverse areas of performance and recording, from the Los Angeles Philharmonic to principal cellist of the long- running (19 years!) hit television series, "The Simpsons." students at the prestigious School of Music. The title of this event was "Symphony Music, Commercial Music, Business of Music." Before leaving for New York, Kelley said he looked forward to his talk at MSM. "It's like coming full circle to return to New York for an entirely new musical experience," he said. "Early in my career with the Los Angeles Philharmonic, I had the opportunity to play cello at Carnegie Hall. I hope to bring some benefit of my own music background and experience to the students at MSM." Kelley has performed around the world with symphonies, and has also been in the Hollywood recording industry for over 40 years. His studio work ranges from movie soundtracks and television shows to records with legendary pop artists. For over 20 years, Ray and his wife, Cheryl - also a Local 47 member - have operated Resort Music, Inc., a tourism and hospitality-focused music publishing and record company based in Palm Springs. In other education venues, Kelley enjoys his role as Music Advisor to the Palm Springs Unified School District in California, where he brings his cello and stories about music to about 2,500 students at 15 area elementary schools. He is an inspiration to young people, encouraging them to learn more about the lifelong enjoyment of all kinds of music.